A few weeks ago we returned from a great trip to California (if you're interested you can pop on over to my other blog to check out the pics) and ever since we returned I feel like I've been in a whirlwind of activity. First of all, school started, and MAN has that totally changed my whole routine. I guess I just didn't take into consideration that adding a Kindergartner, taking on several more subjects, and trying to avoid being climbed on by Mr. Needy One-Year-Old during lessons would put such a huge cramp in my free time. But boy howdy. I spend hours at the table up there, staring at those pencils and that stack of books, daydreaming of a month ago when I had all the time in the world to crank out projects like nobody's business. Oh well. If there's one thing I've learned from life so far is that things almost never go back to the way they were, so it's best to just get over it and move on. The result of all this busyness, other than the obvious deceleration of production, has been an indifference toward this blog. I mean, what do I put on here now? "Today I cleaned up eggs off the floor while trying to keep the baby away, all while drilling Xander on the difference between a parallelogram and a rhombus!" What? That's not interesting?? Well, it does say "jenn of all trades" up there. I just forgot to draw a picture of a crazed homeschool mom on my banner. Huh? Huh? Whaddya think?? 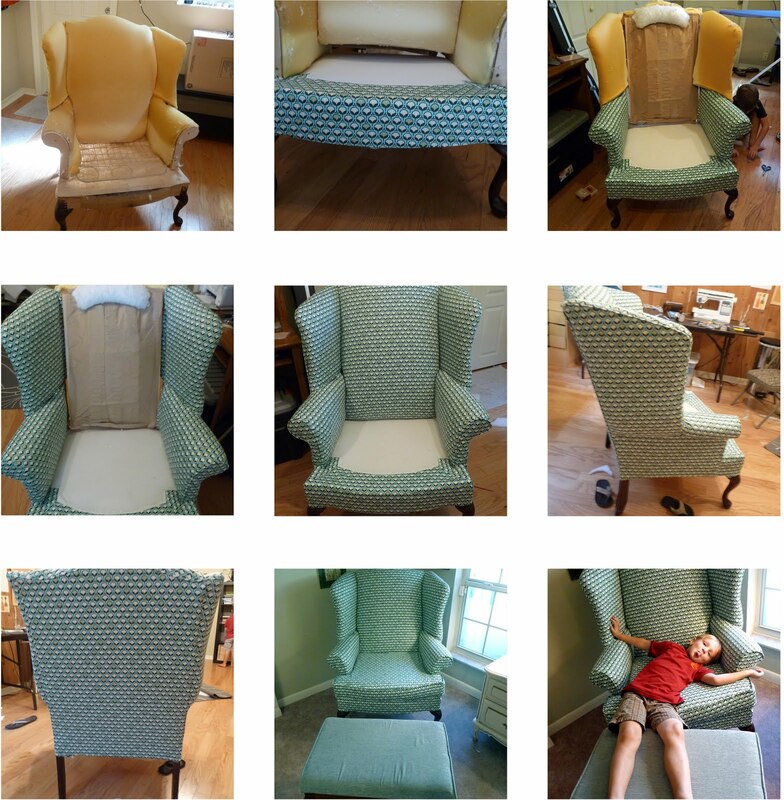 Do I have a future as a re-upholsterer or what? Also, this past weekend we had another meeting of the Tampa Modern Quilt Guild, where one of our members, Gayle, showed us how to make fabric postcards. It was a little hectic because we had two little ones underfoot but it was still nice to get together and work on crafty stuff together. I started a big one (not postcard sized) that looks awful right now so NO PICS FOR YOU. I did do this little one the other day, it's still not finished and I'm not sure I like it but hey. Also, since the team from our church is heading over to Swaziland next week, I've finally been able to start working on my middle son's long-promised quilt. He knew I couldn't start it until the Swaziland madness was over and done and he was very patient, but it was time. I had a nice quilting break but now I'm back in the saddle again. I just go a LOT slower now. I hate the way this picture came out but oh well. His request was for a quilt with rockets, that was red and had blue in it, too. Since that seemed a little garish I decided to throw in some charcoal and ash and the result was a little more pleasing. My friend Elizabeth made a quilt top for her friend Carly, who was in a bad accident recently, and she asked me if I could quilt it for her. I started it today and came THIS CLOSE to finishing, but I broke four needles today and now I'm out. So aggravating. And it's not like I can just pop on over to Jo Ann Fabric in my imaginary car and get some more. I think God is trying to teach me patience today cause I about tore my hair out over that. Oh yeah, and Heather over at A La Mode Fabric invited me to join round 2 of the Quilt As You Go project. I was flattered to be invited, so of course I said yes. Have I actually done anything yet? Ok, so how in the world does the reupholstering work? Did you follow a tutorial? I just don't understand how you attach the fabric to the chair. I have one that I'd like to do someday.. I think your fabric postcard looks great. I'm doing a crafty social with cards late Sept. Wish you could come! I can email you a little step by step if you want. There weren't any tutorials that I could find that were very clear unfortunately, so I had to wing it. Oh, get it, "wing" it, oh ha ha I'm HILARIOUS. I wish I could come to your social, too, and did I mention the jealousy over getting to go to AMH's skirt workshop? SO JEL. The chair looks awesome, Jenn. Also, Ecclesiastes 3 comes to mind as I read this. And, you are not alone! Your egg cleaning scenario has totally been played out here at least once or ten times before. And I know I'm not alone in my hectic crazy egg-splattered days...but there are times my life feels so...unglamorous compared to other blogging moms. I know it's not true, they just take better pictures, but still. Ha. this blog has too many treats. The chair is awesome. Send me steps too! I have an old chair that could use some sprucing up.